FIGURE 3. Tropidurus lagunablanca, n. sp. B. Adult male (not collected). E. Female (AMNH-R 176293, paratype); G. Biological station inside the Reserva Natural Laguna Blanca, showing the trees used by T. lagunablanca, n. sp., at the type locality. FIGURE 5. Tropidurus tarara, n. sp. A. Adult male (MNHNP 12044, holotype), B. Adult female (AMNH-R 176305, paratype). E. Natural Cerrado landscapes from Reserva Natural Cerrados del Tagatiya and sur-roundings, Department of Concepción, Paraguay. FIGURE 7. Tropidurus teyumirim, n. sp. A. Adult male (MNHNP 12045, holotype). B. Adult female (AMNH-R 176285, paratype). G. Exposed sedimentary rocks used by T. teyumirim, n. sp., along the margins of the Arroyo Corrientes at a site known as Salto Mbocarusu, located in the Parque Nacional Ybycui. Tropidurus Wied, 1825, is one of the most ubiquitous lizard genera endemic to South America. Herpetologists from different regions of the continent have progressively mapped new populations, including undescribed species hidden under widely distributed nominal taxa. Currently, four monophyletic species groups are recognized in Tropidurus (T. bogerti group [monotypic], T. semitaeniatus group [four species], T. spinulosus group [five species], and T. torquatus group [16 species]), but none have been comprehensively revised taxonomically. 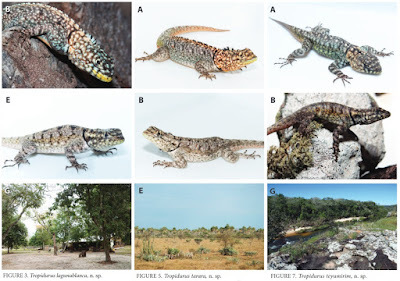 During a collection expedition carried out in Paraguay in 2013, I recognized three new, distinct morphotypes among populations of the Tropidurus spinulosus group formerly assigned to T. guarani Alvarez et al., 1994. To delimit these new taxa, I analyzed coloration patterns, and quantified meristic and morphometric variables, comparing freshly collected samples with specimens housed in five museum collections. In this paper, I describe and illustrate the allopatric Tropidurus lagunablanca, n. sp., T. tarara, n. sp., and T. teyumirim, n. sp., and provide notes on their distribution limits, natural history, and conservation status.